1. A state or condition of inactivity or lack of continued use; with an indication of neglect, disrepair, or inaction: The neighborhood school grounds have fallen into desuetude as a result of a lack of funds to repair the areas around the buildings; including the overgrown weeds and the broken playground equipment. 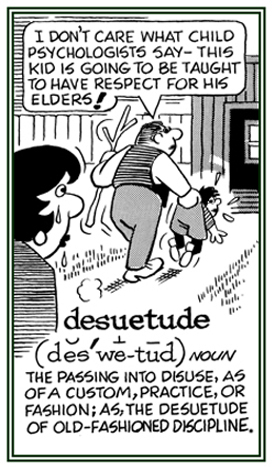 There are many words from the past that have fallen into desuetude. 2. 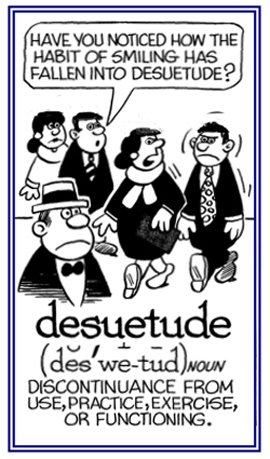 Etymology: from French désuétude; from Latin desuetudo, from desuetus, the past participle of desuescere, "to put out of use"; from de-, "reversal" + suescere, "to be accustomed". © ALL rights are reserved.